Thanks to Twitter I know some of the German online RPG community which is totally awesome. There are nice people out there, and it allows me to be introduced to new, fresh RPG systems I have never tried before. The first system I tried was Trail of Cthulhu, and now I had the opportunity to be a player in a second one-shot, the game system being 7th Sea. I had never played the first edition of this game, but it was hard to miss the most successful RPG Kickstarter of all times. The core rules were just released in German by Pegasus. The setting is certainly the standout feature of 7th Sea, a setting bursting at the seams to tell stories of high adventure. The campaign world of 7th Sea is Théah, very similar to real world Europe, and it brings together different historical periods and nations of our European history. It’s not difficult to immediately associate a nation in Théah with its RL equivalent. 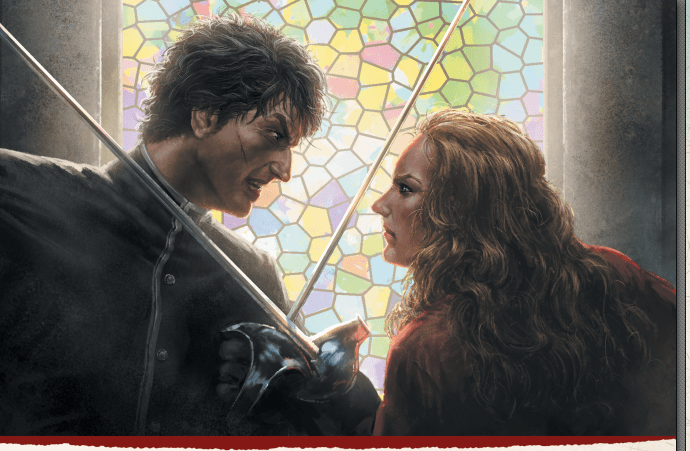 In 7th Sea you don’t play a low-level character, you play a hero. A pirate, a musketeer, someone at a royal court playing at intrigue or being an ambassador for your nation. Inspirations for this game are Pirates of the Caribbean, The Three Musketeers, The Man with the Iron Mask or The Princess Bride. In our one-shot, our GM Sal had prepared an adventure he created himself, based on the character concepts we had come up with before the game. He created the characters for us after we had come up with our character concepts. Vivienne d’Estival – my character, an actress/spy working for the Marquis Duc de Marchinaud in Montaigne. L’Empereur in Montaigne was expecting a new ambassador from the rival country of Avalon, Quinn Leord. However, this ambassador never arrived, instead replaced surprisingly by a woman called Sybill Shawn. The Marquis, who was to bring the ambassador to the king, he asked our three heroes to travel to Avalon for him, to the capital of Carleon. There they were to investigate the disappearance of the original ambassador. After arriving in Carleon, Rémi ended up in a tavern fight in which he proved he was the stuff of heroes by jumping onto 5 guards and knocking them all out in one blow. Just as you expect from a musketeer. During the fight, a suspect who appeared to be involved in the ambassador’s disappearance tried to flee the scene, but Tamara pinned him to the floor with the skillful use of her throwing knives. After the informant was questioned and intimidated professionally, he told the travelers from Montaigne that a merchant and friend of the ambassador had given him the task to sit and wait for the arrival of investigating parties from Montaigne, so that he could alert him and the Montaignans could be disposed of. The group took the informer’s carriage and an invitation to a party that said merchant was hosting for a group of traders from Voddace. It turned out that the merchant was holding the ambassador captured, and had the ambassador’s daughter jailed in his cellar as a hostage. Thanks to the heroes from Montaigne, the ambassador and his daughter were rescued, in a dramatic flight. The Queen of Avalon was informed about the machinations of this merchant. 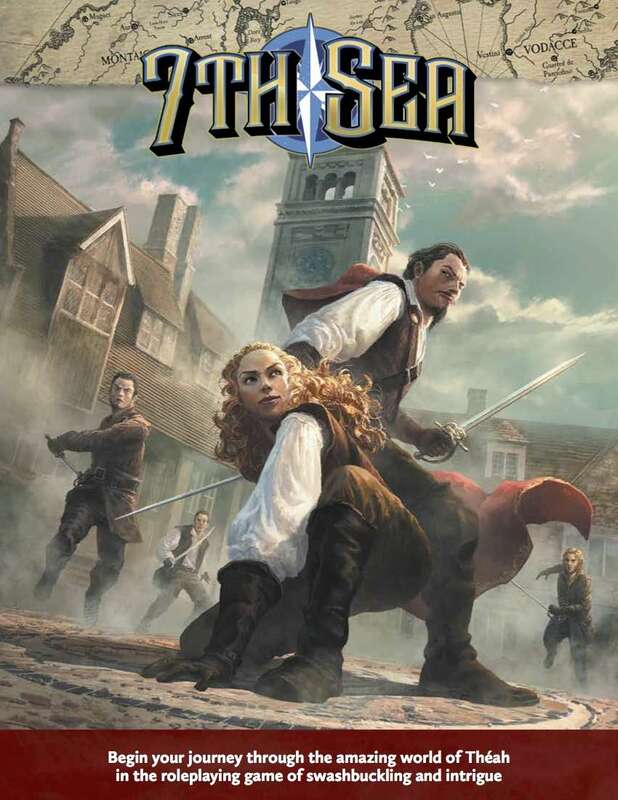 7th Sea wants to make sure that the characters feel like heroes right from the start. You’re not some level 1 adventurer who has to crawl through dungeons, no, you are a valued hero. When you roll dice on tasks, you have a large dice pool that allows immense successes. The dice pool system takes some getting used to. For checks, you roll one of the 5 main attributes Brawn, Finesse, Resolve, Wits or Panache, plus the fitting skill. You add up the points you have in those two. Per point you get to roll 1d10. Furthermore, 7th Sea wants you to do heroic, non-repetitive tasks. In every scene, you get a bonus d10 when you use an action/ability for the first time. Let’s assume that my character Vivienne is trying to convince an informant to tell her everything. I could roll Resolve or Wits plus Convince. With Resolve 3 and Convince 3, that’s 6 dice, plus a bonus die for the first use of Convince in that scene. Let’s roll 7d10. Now, from the results of those dice, you try to get the value 10 as often as possible, a so-called Raise. Raises are your currency for dramatic actions, the more you have, the more successful your action. You pretty much end up with very high dice pools. That means you can end up being very successful and heroic. I think the biggest pool I saw for a roll was when our musketeer used a hero point during the end fight as we tried to make our escape with the ambassador and his daughter. He got to roll 11d10! Each character in 7th Sea can create hero points that you can use for special abilities. My character had the ability to use a hero point to draw the attention of an NPC to her. Another option would have been to sweet-talk someone into giving Vivienne an item of her choice. You receive hero points for playing your character according to your two backgrounds. I had the courtier and performer backgrounds, which e.g. would have gotten me a hero point if I stopped a violent confrontation with the use of my charm. Furthermore, each character has a Virtue and a Hubris. If you play out the latter, you also gain a hero point. In my case, this would have been if Vivienne had done something foolish because of an old grudge. As we only played a 4 hour one-shot we didn’t actually use the hero point system much. There’s another way of gaining hero points. The GM can buy Raises from the player for hero points. The GM can use those Raises at a later point to introduce difficulties for the characters. It reminded me very much of GM Intrusions in the Cypher System. There, players receive an XP for accepting an intrusion. We didn’t actually use the magic system because we all kinda forgot about it. Time was running out for us due to the late hour. The one-shot whet my appetite for this system. I think 7th Sea is probably great as a campaign system and not for one-shots. In limited time you simply cannot experience all the intricacies of the system. I could easily imagine a mid-length campaign of high adventure. Especially as every character has to pick a story with a goal when creating the character. The system is easy to understand and we only scratched the surface. The focus here is action and drama, and the one-shot showcased that very nicely. The German hardcover is extremely cheap (20 Euro, wtf!) so I think I will soon add this game to my hardcover collection. If you want to get a free look at the system, you can download the Basic Rules for free on the John Wick Games website.